The 1st April 2018 having recently marked the 100th anniversary of the Royal Air Force’s foundation, this poster shows how ‘the local RAF’ marked the RAF’s 50th anniversary. 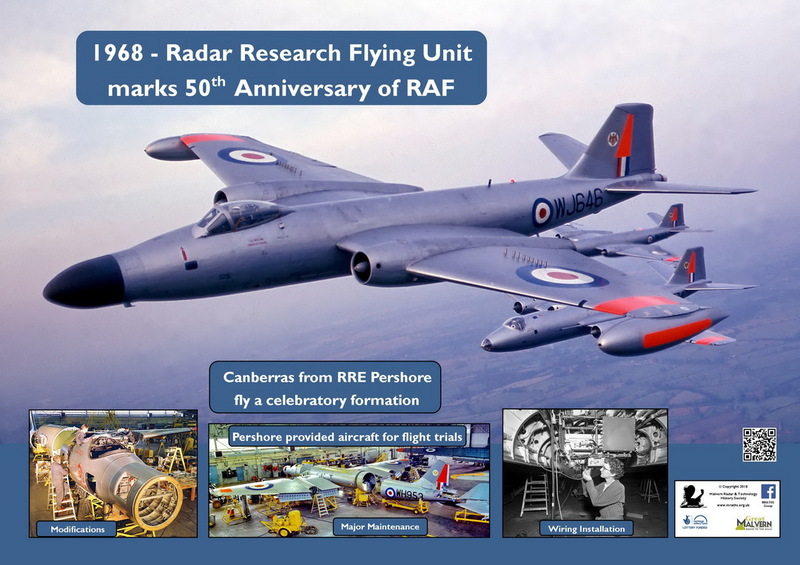 ‘The local RAF’ comprised the two dozen pilots, navigators and flight engineers posted to the Radar Research Flying Unit (RRFU) of the RAF, at Pershore Air Station, to fly RRE Malvern’s fleet of aircraft based there. 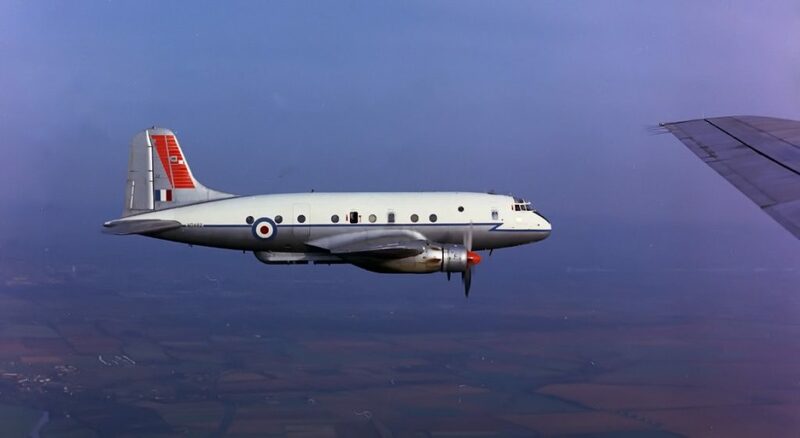 The aircraft, though carrying RAF markings, were actually owned by the Ministry of Technology and were loaned to RRE by MinTech, the Government ministry which controlled RRE at the time. The three Canberras were flying in formation with one of RRE’s large, 4-prop Hastings aircraft. MRATHS has a strict policy of honesty, so we will admit that the picture tells a small ‘fib’ ! It was not taken on 1st April 1968. The pilots of RRFU were selected for this posting because of their career experience. Many of the trials planned by RRE’s ‘boffins’ demanded steady and precise flying. These pilots were well capable of that, but RRE-type flying never included formation flying; they would have done some of it at a previous time in their careers but, for safety (and pilot-pride!) reasons, it was essential that skills were re-honed before the day of the Golden Jubilee formation. The intention was that, on the day, the formation would overfly the Worcestershire, Gloucestershire and Herefordshire towns which were used to seeing RRE’s aircraft flying their trials. The date chosen for the practice was an early evening in March 1968 and the place was the Vale of Evesham, to the east of the airfield. It was a beautiful, early spring evening (I was there) and the sortie lasted a couple of hours. 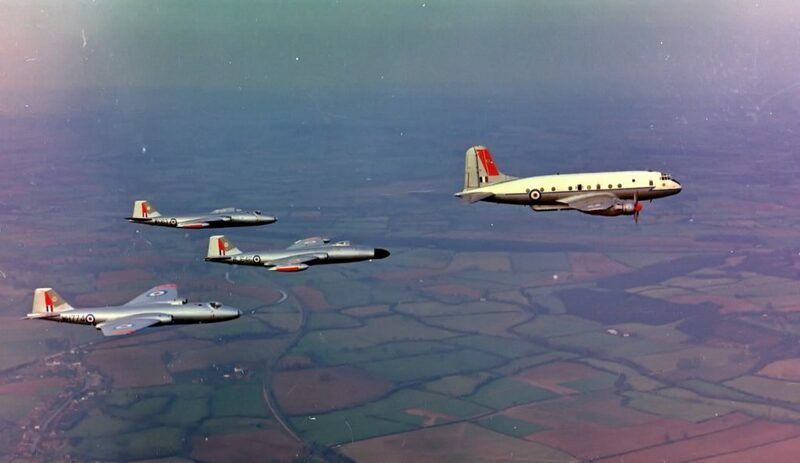 One of the two staff photographers of the airfield flew in the Hastings and the other flew in a RRE Varsity aircraft which ‘stood off’ to photograph the whole formation. Residents of the area, who were well used to seeing RRE’s aircraft going about their ‘secret’ trials singly or, occasionally, in pairs, but not en-mass, probably wondered what was going on! Come the great day, the weather was rubbish! There was total cloud cover with a low cloud base; flying was possible, but flying the planned long sortie was pointless. On this special day, honour had to be satisfied, so the formation took off, overflew the airfield and Pershore town, and landed. 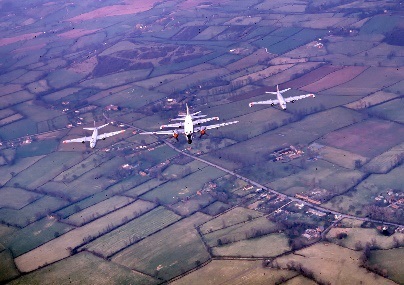 The aircraft in the formation were RRE’s unique Hermes Mark 2 (VX234 – a Hastings lookalike, but longer), and the three Canberras (WJ646, WH774 and WK163). A single ground-to-air photograph records the event. It’s fortunate that a special effort was made to photograph the formation practice! 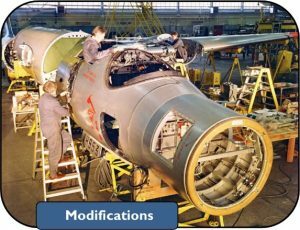 The small images are relevant to the main photo: all three of the Canberra’s in the formation (WJ646, WH774 and WK163) had been subjects of the exceptional in-house modification capabilities of the airfield’s staff – design, manufacturing and installation. WJ646 (foreground) had its complete cockpit/nose section replaced by the same major component from a later mark of Canberra, and then the large and complex AI Mark 18 radar system was installed in the aircraft. It can be seen that its new nose has been modified to have a glass fibre radome (Pershore designed and manufactured) behind which lay the radar scanner. The aircraft flew from Pershore airfield for many years on AI 18 development trials. AI 18 was fitted only to the naval Sea Vixen fighter aircraft: the original intention in the early 1950s was for it to be the interception radar for other planned fighters: they were all cancelled. WJ646 was later used to trial a Hughes Infra-Red Search and Track system. WH774 was modified to collect IR signatures from ship targets and also conducted trials of the Red Top missile and the Decca Navigator system. WK163 had its complete wing (including engines and undercarriage) swapped for a wing built for a later mark of Canberra. The new wing featured increased fuel capacity, the engines were more powerful, and the undercarriage included an improved braking system. This permitted trials of various experimental Synthetic Aperture Radars to go ahead. WH774 and WK163 were transferred to RAE Farnborough when Pershore airfield closed.